No sooner was Geoff back from his travels and I had him out on a 200km Audax strike while the iron is hot was my plan. It was the Norfolk Special from Lound near Lowestoft, it’s quite a drive for an early start so we decided to stay over in Lowestoft. Now we have done quite a few Audax it’s nice to see familiar faces on these rides. I had already done one 200km Audax but this was to be Geoffs first, I knew he was perfectly capable of doing it, it’s just a matter of pacing yourself, something Geoff is not too good at. He starts off quickly trying to keep up with the fast boys then runs out of steam before the finish, whereas I go out slower and have energy at the end. 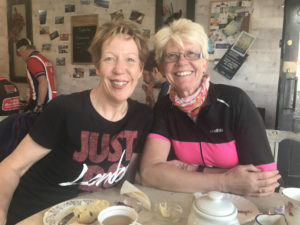 As always the route did not disappoint us, we were lucky with the weather, the route had plenty of info points and 2 cafe stops, one in Wymondham where our friend Jayne lives, so we arranged to meet her there for a coffee which was nice. Doing these rides has taught me that there is more to riding than bombing round the countryside as fast as possible which means I enjoy the more relaxed riding an Audax offers. So another fab day out on our bikes Geoff said never again but I have other plans !!!!!! This entry was posted in Audax, Biking, Personal on June 19, 2017 by Sally.